Kayla Sharples plays a pass. The senior defender scored the game-winning goal on Friday. For the fourth straight year, Northwestern opened its season with two wins in its first weekend of action. Playing in the Hoosier Challenge Cup in Bloomington, Indiana, the Wildcats defeated Miami University 2-1 on Friday and Wake Forest 2-0 on Sunday. In the opening game of the season, NU got off to an early start via a goal from sophomore Regan Steigleder about 14 minutes into the contest. The Cats held the lead for 30 minutes before the Redhawks’ Olivia Winnett equaled the score at one on a shot just before halftime in the 44th minute. 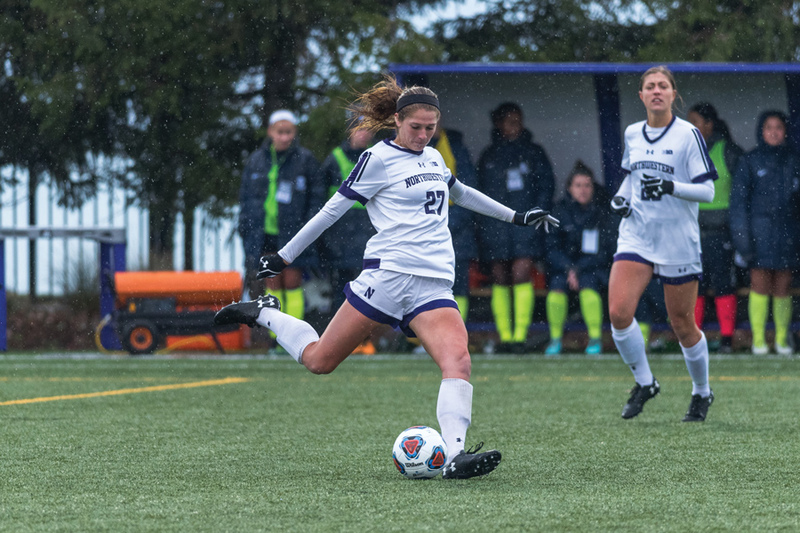 It did not take long for NU to regain the lead in the second half, as senior Kayla Sharples scored 12 minutes after the restart to give the Cats a 2-1 lead. NU took eight shots in the second half — which featured a 90-minute lightning delay — while Miami took zero. The Cats got another early lead in its second game of the cup against the Demon Deacons. Sophomore Nia Harris slotted home a shot six minutes into the contest to give the Cats a 1-0 lead. Senior Brenna Lovera doubled the advantage in the second half when she headed home a cross from sophomore Madi Kennel. Freshman Mackenzie Wood started both games in goal for the NU. After facing only shot against the Redhawks, the goalkeeper made three saves and recorded her first career shutout against Wake Forest. The Cats return to action this weekend in the Boilermaker Challenge Cup when they face off against two Big 12 opponents, Iowa State and West Virginia.